Today at the NYU Game Center was the second day of Marc Leblanc’s “Mechanics-Dynamics-Aesthetics” Game Design Workshop. 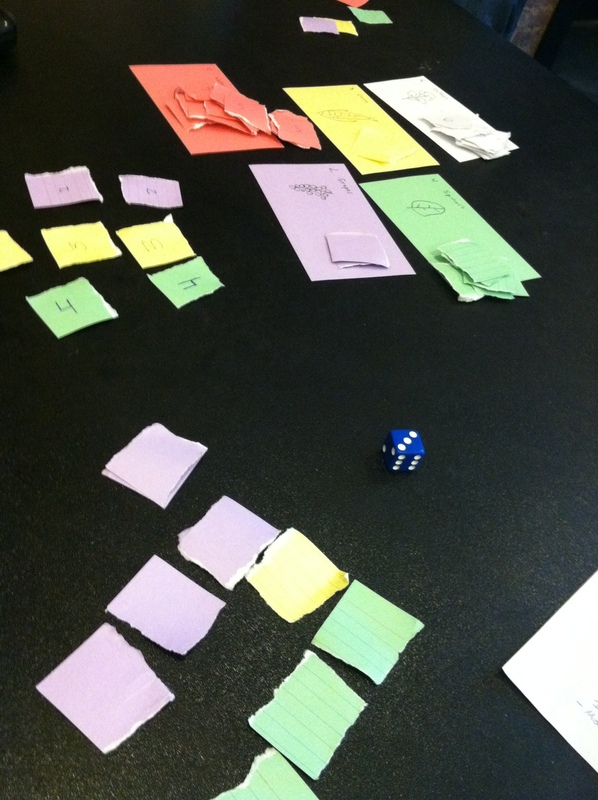 One exercise, was to take a videogame (from a fairly randomly selected list) and distill it into a paper prototype that captured it’s essence and core mechanics as well as possible. 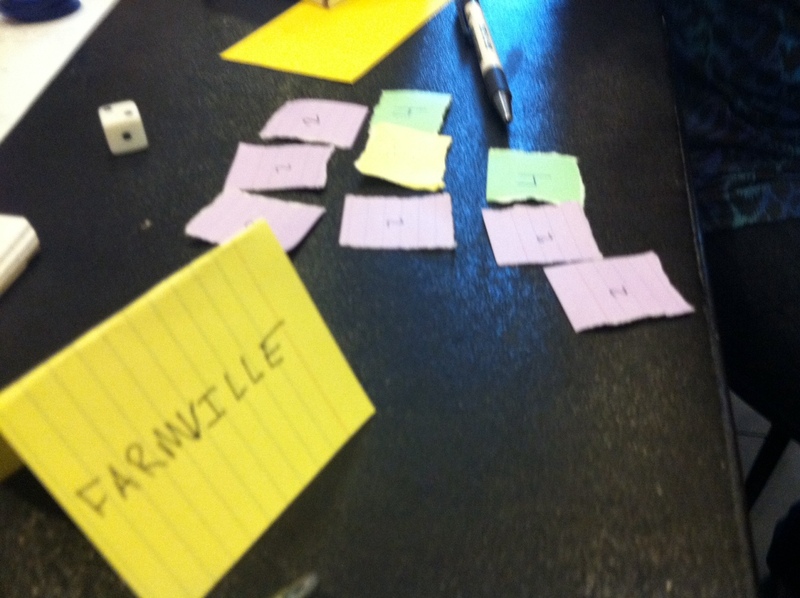 I, along with Nicole Leffel, Lance Vikaros, Tim Szetala, and Haitham Ennasr chose to work with Farmville. We never quite got it to that perfect state, but it still managed to capture the soul of the game fairly well in the short period we worked on it, and I think it’s worth sharing just for that. Generally, this is how it worked: In the middle of the table are 5 types of crops laid out, costing incrementally form 2-6$. They also each came with a different colored square of index card you took upon purchasing one. Each player sat around the table with a 6-sided die in front of them set to 1 at the start. The number on the die representing how many dollars they have. On a player’s turn, which rotated around the circle, they could advance their die by 1, or spend the number shown on their die to harvest crops. They also had to advance one other player’s die by 1. So say I’m going first, I advance my die from 1 to 2 (since no crops can be purchased for 1) and advance my neighbor’s die to 2. So now its my neighbor’s turn, his or her die is already at 2, so instead of incrementing it yet again, they choose to buy grapes for 2: resetting their die to 1 and taking a blue square representing some grapes. It was important for the players to be able to see all the glamorous colors of plants they could buy if they saved up long enough. Turns continue to rotate, players advancing each other’s die, advancing their own, and buying crops. Once players have crops, however, they start to arrange them in their “farms” that exist right in front of them. This provides the forum for both expression and functionality that exists in a Farmville farm. 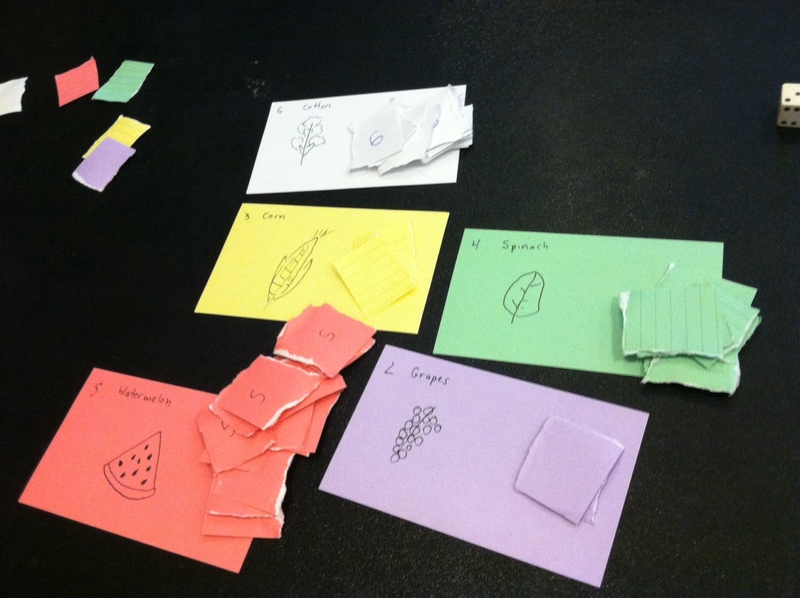 Not only could it be self-expressive via which colors and plants were chosen, and how they were arranged, but they also served to provide a loose scoring and ranking system that could parallel the level system in the original game. Each plant had a number, relative to how much it costs. If you arranged three of the same plant in a row or column, or any three in a series of sequential numbers, you could flip the set, gaining points equal to the sum of the numbers flipped. You could also build off an original flipped set, say, adding a 4, and a 5, perpendicular to a set of 3’s. The 3 WOULD be counted again, thus yielding an additional 12 points on top of the 9 already achieved. This further incentivized saving up for the bigger plants, since using them twice offered an exponentially larger benefit than using the smaller plants twice. Communal crops to buy in the middle, beginnings of farms below and to the left. Much like real Farmville, however, players seem to lose interest in the point and ranking systems. Honestly, this was mostly because it was rather flat. Like the Facebook game, all players were participating for an equal amount of time, so they gained roughly the same amount of total plant resources and thus all had fairly close scores. However, there were neat little occurrences where a player would get up to go to the bathroom or look at other games. During this time other players still advanced his or her die on occasion, but once it got to 6 it became stuck there, and no progress on their farm could be made. So in the end, the “game” itself wasn’t particularly engaging or strategic. The social interaction was simply turning someone’s die over, hoping they might chose your die to advance on their next turn. It was light, but enjoyable, much like the social interaction in Farmville. The real pleasure from the prototype came from doing what you wanted in terms of buying and arranging crops, while chatting with neat people at the same time. So in that sense, it’s hard to say we didn’t succeed in our objective at least a little. Maybe we even showed that when you strip out the micro-transactions, graphics, advertising, and publicizing that surround it, Farmville still has a mechanical structure that is potentially endearing.